The NFL season is soon due to kick off! September 6th, defending Super Bowl LII champion Philadelphia Eagles will be hosting the Atlanta Falcons. We are in for an exciting season that will end with Super Bowl LIII on February 3, 2019, at Mercedes-Benz Stadium in Atlanta, Georgia. 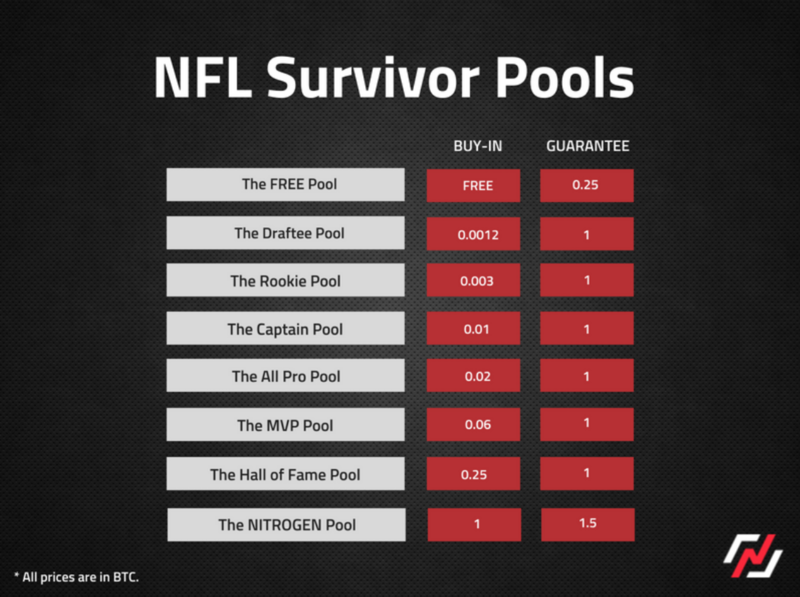 One exciting game, which is even free to participate in, is the NFL Survivor Pool offered by the Bitcoin sportsbook, Nitrogensports. You open an anonymous account on their site and then you can join a free pool which has a 0.25 BTC (Bitcoin) added. So you can even win money, without risking anything. You can also participate in their pools that cost money and they of course offer the possibility to win even more money. -ins for everyone. You are allowed to buy-in more than once to any single pool except the free pool. The idea is to pick a team to win each week. For example, if you think the Miami Dolphins are going to beat the Tennessee Titans in their week 1 matchup, you might pick them. For week 1, your pick is Miami. If you’re right, and your team wins, you survive and you get to pick again in week 2. If you’re wrong and your team loses, you’re out of the competition. The tricky part in all of this has to do with how many times you can pick a team to win. Let’s say you pick the Dolphins in week 1 and they win. The you are no longer able to pick the Dolphins to win in any subsequent week. It gets really hard near crunch time when only the worst teams are left for you to pick from. 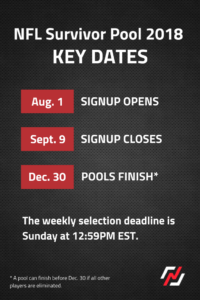 Good survivor pool players carefully plan their picks weeks in advance and adapt as new circumstances arise. If more than one player is left standing at the end of the schedule or if more than one player goes out on the same week and no one else is left (this is most common), the prize is split evenly. How do I join the payed pools? If you want to add money and join a payed pool, then you will need to transfer bitcoin from a bitcoin wallet. They are quite easy to sign up to. 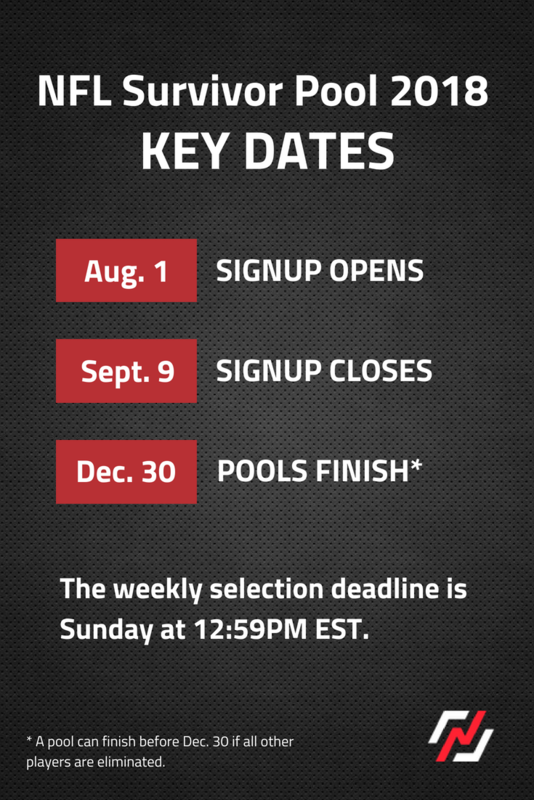 All pools close for new entries just before the first Sunday games start on September 9th (12:59 PM EST). Just click this link and sign up. 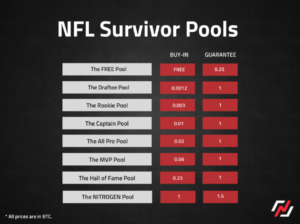 Once signed up you will find the Survivor Pool under the Nitrogen side menu.